Having the right gear is just as important as having the right bike when you begin mountain biking. From mountain biking shoes to bike pants, it’s important to get the right stuff to ride comfortably. There are also a lot of different options when it comes to gear which can change based on the trail you’re on and the temperatures you’re riding in. The same shoes and clothes that you ride with in Arizona may not be the same kit you use when taking on the trails in a Colorado winter. That is why it’s important to know all your options and get the right gear to ride. First, knowing your mountain bike trail is an important part of getting the right gear. For example, if you are riding in a very challenging trail with jumps and obstacles, it would be a good idea to get some padding. This could include your run of the mill knee, elbow, and shin pads, or you could get bike pants that come with some padding already embedded. Other bike gear that is important to have around on your mountain biking expedition is repair equipment for your bike. An air pump for your tires, a multi-tool with a chain breaker, an extra chain, and a some chain lube can all go a long way to getting you back on the trail if something goes wrong. Also, it should always just be a rule of thumb to have equipment with you should you find yourself stranded on your own. Stocking yourself with snacks and water can be a good way to ride longer. A large backpack or duffle should be part of your bike gear and can help make it easier to carry while riding. We always suggest taking extra water and snacks to keep hydrated and full of energy while riding. More Control: Mountain biking shoes come in many forms, but the most common is the clipless shoe. These shoes come with what can basically pass as a cleat that helps you hook into your bike. This tighter connection also offers a better amount of control, which can help you maneuver around tight bends and more complicated sections of the trail. Improved Power: When using mountain biking shoes, you are essentially secured to the pedal, which can help you get more power while pedaling. First, you can actually bring the pedal up faster and push it down more efficiently, in turn converting into more power while pedaling. This can help when riding at an incline. Better Safety: If you are using cage or just standard pedals, you feet could either get stuck or slip off too easily. While riding through a trail, slipping out of your pedal can cause your foot to get caught or worse result in you falling off the bike. By being connected to the pedal, you never have to worry about this issue, and can actually improve your confidence while challenging the trails. If you’re considering mountain biking beyond a recreational level, investing in mountain biking shoes is a must. Not only do they make your pedaling more efficient, but also they can improve your overall enjoyment while on the bike. The easy answer to this question is that bike pants are designed for mountain biking. They are rugged and sturdy to prevent tears while riding, and in some instances, they even come with padding to help combat the bumps you may get from a day on the trails. MTB shorts and bike pants come in many forms and styles, but generally boil down to two; baggy or lycra. 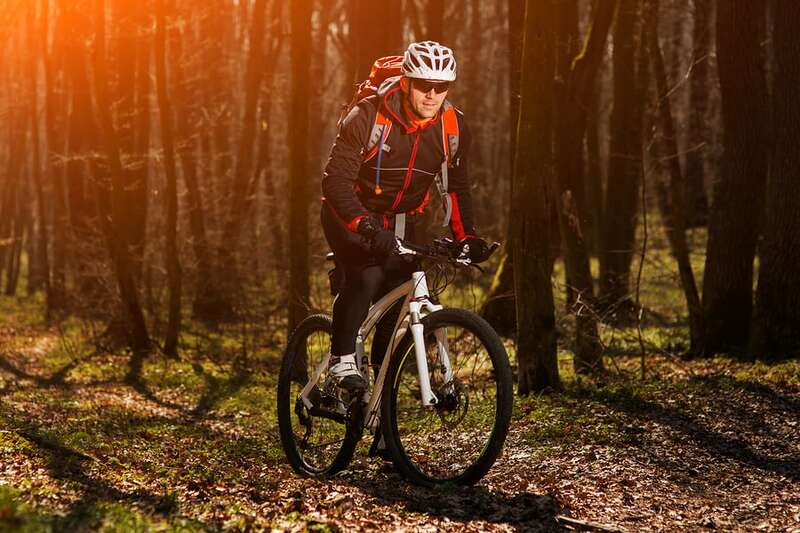 Baggy shorts are rising in popularity now because of their quality, sturdiness, and the ability to offer additional storage for your longer mountain biking rides. While lycra offers a tighter fit, it provides less protection, and is often being used in conjunction with baggy mtb shorts. You can always wear bib shorts, which come with padding in the saddle, but because some sections of mountain biking require riding off the saddle, it is not as important. Be sure to shop around and try on different shorts to see which work best for you. Some of the most popular brands of mtb shorts include Fox, Endura, Specialized, and Pearl. If you’re looking for a company that offers reliable mountain biking equipment and gear, a great suggestion is Recreational Equipment, Inc. (REI). Founded in 1938, REI is one of the oldest outdoor recreation companies. REI bicycles are some of the best frames on the market and they also offer plenty of solutions for your components, gear, and accessories.